Read here about a researcher prominent in the field of tensegrity-based robotics. Alice Merner Agogino is an internationally renowned scholar who is widely respected for her interdisciplinary research in human-centered design, her contributions to engineering education, and her effectiveness in broadening participation within the field of engineering. As an educator, her efforts have encompassed improvements to undergraduate engineering education and K-12 science and technology instruction, as well as gender equity and digital libraries focused on science, technology, engineering, and mathematics. In addition to her scholarship in the field of teaching, her disciplinary research has focused on sustainable design, computational design, computer-aided design based on micro-electro-mechanical systems, monitoring, diagnostics, prognostics, and intelligent control, sensor validation, and more. At the time of this writing in 2014 Dr. Agogino is the Roscoe and Elizabeth Hughes Professor of Mechanical Engineering and affliated faculty at the Haas School of Business in their Operations and Information Technology Management Group. She directs the BEST Lab and over the years has served on various Berkeley administrative bodies. Prior to her joining the faculty at UC Berkeley, she worked in industry for Dow Chemical, General Electric and SRI International. Dr. Agogino received her B.S. in Mechanical Engineering from the University of New Mexico (1975), M.S. degree in Mechanical Engineering (1978) from the University of California at Berkeley and Ph.D. from the Department of Engineering-Economic Systems at Stanford University (1984). Over the years Dr. Agogino has received many awards acknowledging her innovative work, including an NSF Presidential Young Investigator Award in 1985; Pi Tau Sigma Award for Excellence in Teaching in 1986; Ralph R. Teetor Educator Award in 1987; and an AAAS Lifetime Mentoring Award, 2012-13. 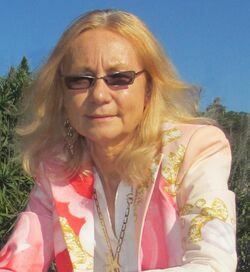 Dr. Alice Agogino, photo from her website. Agogino has won five “best paper” awards for her research in mechanical engineering as well as an additional three “best paper” awards for her work in engineering education. She has published more than 200 peer-reviewed papers, and she is the co-author, with her graduate students, of 12 course modules. "SUPERball: Exploring Tensegrities for Planetary Probes", (with A.P. Sabelhaus, A.P., K. Caluwaerts, J. Bruce and V. SunSpiral) to appear in Proceedings of the 12th International Symposium on Artificial Intelligence, Robotics, and Automation in Space (i-SAIRAS), June 2014. "SUPERball: Modular Hardware for a Mobile Tensegrity Robot", (with A.P. Sabelhaus, A.P., K. Caluwaerts, J. Bruce and V. SunSpiral) to appear in Proceedings of the WCSCM6 (6th World Conference on Structural Control and Monitoring), July 2014. It is Dr. Agogino's leadership of the BEST lab that brought her to the attention of the tensegrity community: see full article here. BEST lab description: see BEST Lab, Berkeley California. This page was last edited on 18 November 2018, at 04:26.